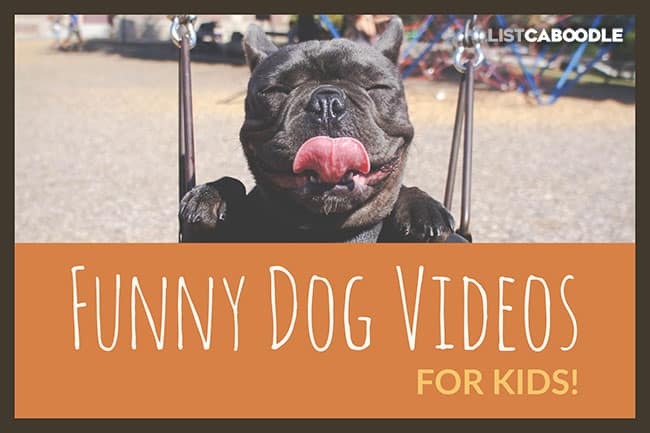 Kids love to watch funny dog videos because of all the unexpected things dogs do. These ten funny dog videos feature cute dogs and puppies doing all sorts of entertaining things—from playing to talking to just being adorable. Watch as this little baby bulldog named Piper tries to bark for the first time ever. He builds up his energy and lets out a bark, only to topple over from the effort. It’s just adorable. He didn’t realize how loud he could be and startled himself in the process! This rescue dog named Honey loves to sing along with Michael Jackson. When her owner puts on the radio, she stays quiet until the King of Pop comes on. Then she bellows out right along with the song! She throws her head back and really gets into it. You won’t want to miss her hilarious performance! It’s not easy figuring out how to bring a long stick through a skinny opening. This dog is excited to bring the stick inside to show all the people. But that door is just not open enough! After a few tries, he drops the stick and comes inside. He must forget how it didn’t work, because he goes back out and tries it again. This video will keep the kids laughing! This very popular video shows a happy bulldog walking out on the kids’ trampoline in the backyard. He first tests it out slowly, then starts to really enjoy bouncing up and down. You can see the big smile on his face and how much he enjoys it. He can really jump high! And now for something completely different… a talking dog! This video features a voice-over that makes it seem as though the dog is having a conversation with his owner. The dog finds out about all the special treats the owner has eaten from the refrigerator and even one special treat the cat ate. His reactions are priceless and hilarious! Your kids will be amazed by the talking dog. Boston Terriers are known for having a very expressive face. In this video, the playful pup makes all kinds of funny expressions. He likes to be tickled and even wrestle with his owner’s hand. He smiles and looks funny with his big eyes. He’s a cute little Terrier. This dog’s name is Simon and he likes to pop balloons. Watch as he takes on 100 balloons in just over a minute’s time. He bites each one until it pops. He’s a relentless little terrier! This famous video features a skateboarding bulldog with amazing skills. He can go fast on his skateboard and keep it under control around all the people. He can even make turns and stops by putting his paws down on the pavement. The crowd of people watching is really entertained by his skateboarding ability. And he seems to really love it too! In this video a cute dog named Buddy is talking to his owner. It’s almost like he’s trying to tell him something. Maybe your kids can guess what he’s saying? Does he want to go out and play? Is he just hungry? It’s adorable how he makes the different sounds as if he’s trying to form words. So cute! Husky communicates with baby – cute! This video is amazing! The husky and the baby seem to be having a conversation in their own language. They are both very talkative and it goes on for quite a while. Just when you think they’re done, the baby has more to say. And like a good dog, the husky always replies to whatever the baby is saying. Your kids will love this cute dog and baby talking video! Dogs and puppies are endlessly fun to watch. These ten videos show dog behaviors from funny to cute to just plain adorable. Your kids will enjoy all the different dog activities and the many games they play. Be sure to check out 10 Funny Cat Videos For Kids for more great videos your kids will love! And, embarrass your kids with these fun Dad Jokes. For those pet lovers who have a new kitten in the family, here’s your guide to unique cat names kids will love.